The Guest House at Field Farm offers walking trails. If you’re looking for a low-key escape, consider a cross-country ski weekend in Williamstown. The Folly, a cottage used for parties. This quaint collegiate village, nestled in the northwest corner of the Berkshires, is downright romantic in winter. Cozy inns beckon with crackling fires, the scent of slow-roasting Berkshire meats waft through restaurants, and snow, spread over fields like buttercream frosting, offers the perfect landscape for exercising those newly made resolutions. A good place to start is at Field Farm. 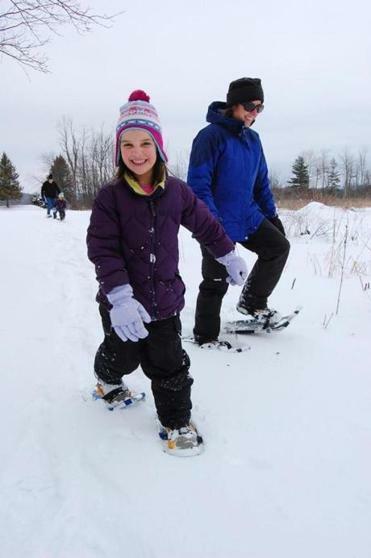 There are 316 acres of conservation land with 4 miles of cross-country ski trails running through open fields and woods. Visitors can take in the beauty of the eastern slope of the Taconic Range and perhaps some red-winged blackbirds and white-tailed deer. You can also make reservations to stay over at The Guest House at Field Farm , which will reopen for the season April 8. 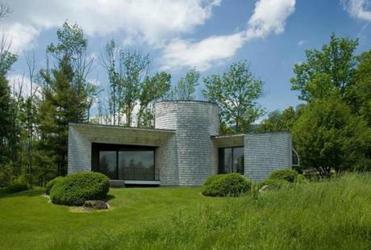 The Bauhaus-style bed and breakfast is formerly the home of Williams College graduate Lawrence Bloedel and his wife, Eleanor. The couple had the house built in 1948; in 1965 they added The Folly, a whimsically designed cottage to use for swimming and skating parties near the pond in front of the house. Although The Trustees of Reservations now owns the inn, you don’t have to be a member to stay there (members receive a 10 percent discount). The inn has only six guestrooms, so they fill up fast. Each room has a different color scheme and most have views of Mount Greylock or Pine Cobble Mountain. Visitors will notice a bounty of modern art on the walls and furniture, such as George Nelson pendant lamps, Vladimir Kagan sofas, and an Isamu Noguchi coffee table. 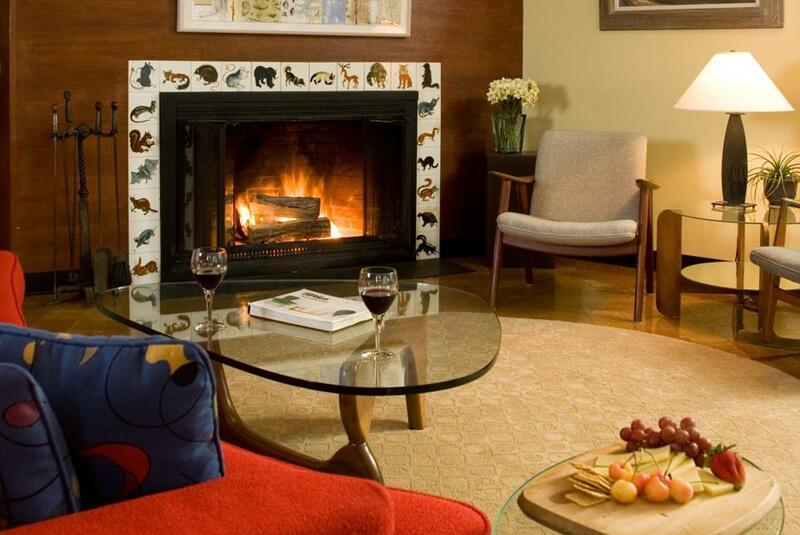 The Bloedels were avid art collectors and the inn’s furnishings and 13 outdoor sculptures reflect their mid-century modern taste. The inn has no televisions, but as a concession to modernity, it offers free Wi-Fi. A good place for dinner is Gramercy Bistro at MASS MoCA in North Adams. If you arrive before the museum closes at 5 p.m., you can take in some of the exhibits before tucking into chef Alexander Smith’s locally sourced, seasonal bistro fare. Although the menu changes often, a meal might begin with a warm poached egg over arugula and endive with mustard bacon dressing or a silky squash bisque. If it’s still available, the seafood-chicken paella served in a small skillet makes a fine supper, as does the rosy duck breast served with a sweet-tangy apple cider sauce. Should you abstain from ordering dessert, you can instead snag a homemade cookie (or two) back at the inn. All rooms also come with a full hot breakfast. Another excellent place to cross-country ski is the Clark Art Institute , which is surrounded by 140 acres of open lawns and trails. Follow the path up to historic Stone Hill for a stunning view of Williamstown and Vermont’s Green Mountains. Trail maps are available inside the museum, where you can enjoy soup, salad, or a sandwich at Cafe 7 in the lower level of the new Clark Center. Alternatively, you can pack a picnic to enjoy beneath the terraces at the Lunder Center at Stone Hill or elsewhere outside the museum. For a pre-prandial dose of culture, stop by the Williams College Museum of Art or head to the shop- and gallery-lined Spring Street to catch a movie at Images Cinema , an independent movie house showing a wide range of classic, foreign, and independent films. If you need a jolt of caffeine, morning or night, stop by Tunnel City Coffee, also on Spring Street, specializing in dark brews, creamy lattes, and homey, decadent pastries. An excellent spot for dinner your second night is Mezze Bistro + Bar , where chef Nicholas Moulton prepares the bounty of the Berkshires in a French blue clapboard home aglow on a hill. Small plates dot the menu, with offerings such as sautéed wild mushrooms crowned with a warm duck egg yolk and crispy ham crumbs. Entrees range from sweet mussels in a porky nduja-spiked broth to juicy pork loin with sweet dumpling squash and bacon lardon. Before you leave the Berkshires, drive up the hill from the Guest House to Cricket Creek Farm . There, in a small, self-serve store (on the honor system), you can load up on the farm’s luscious raw milk cheeses, butter, and baked goods, as well as beef, pork, and chicken eggs, thus providing a tasty way to extend your Williamstown weekend back home.